January, 1977. While the chief of the CIA’s Moscow station fills his gas tank, a stranger drops a note into the car. In the years that followed, that stranger, Adolf Tolkachev, became one of the West’s most valuable spies. 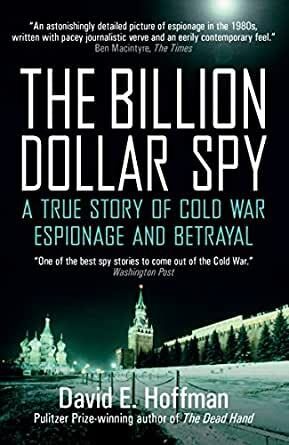 At enormous risk Tolkachev and his handlers conducted clandestine meetings across Moscow, using spy cameras, props, and private codes to elude the KGB in its own backyard – until a shocking betrayal put them all at risk. Drawing on previously classified CIA documents and interviews with first-hand participants, The Billion Dollar Spy is a brilliant feat of reporting and a riveting true story from the final years of the Cold War. Interesting story and well written, possibly much of this story had been embargoed for many years as I can't recall hearing much, if anything, about it over the last twenty or so years. Spoiler alert: it's amazing how in these complex human interactions the whole thing can come undone by a different human interaction and someone's greed and revenge but I guess that's the nature of the game. Surprising that the USA Intelligence system while saving many millions of dollars in research were still prepared to "nickel and dime" (I think the Americans say) a hard working and very brave man taking incredible risks. 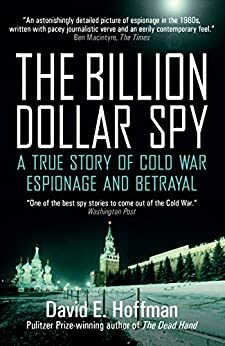 „The billion dollar spy” is the true story of an electronics engineer at a secret military aviation institute in Moscow who for almost seven years provided the CIA with a huge volume of sensitive and valuable intelligence on Soviet research and development (R%D) activities concerning radars, avionics, AA missiles, and other technologies. At the beginning, I hesitated in buying this book, since I read Barry Royden’s internal monograph (good, but objectively less detailed) on the operation issued in 2003, but in the end I decided to purchase the book hoping to find some missing aspects of the aforementioned account. I didn’t regret since the volume is laced with startling revelations - about double agents, human dimensions and problems, covert operations, human and technical operational capabilities, spying techniques and betrayals. For the first time, we get an in-depth story about the Adolf Tolchacev (codename CK Sphere, later GT Vanquish) operation, one of the CIA’s most productive agents, who driven by anger and vengeance, provided United States with intelligence it had never obtained. What makes this operation more audacious was the fact that all 21 personally meetings between him and his six case officers (last three of them “deep cover” officers) happened in a surveillance-heavy environment of the omnipotent KGB. The book is fast-paced and starts in the “Prologue” part with such a meeting which took part in December 1982, introducing - apart the case officer W. Plunkert – a CIA device, simply called Jack-in-the-box (JIB), designed to escape from KGB surveillance. Throughout the book’s 21 chapters the author uncovers several espionage techniques to “move through the gap”, that is, avoid blanket surveillance, and allow CIA to carry out its life-and-death meetings with its valuable source:, identity transfer/deception and street disguise, out-of-country scenarios, JIB or surveillance detection runs. Among electronic devices the book reveals Discus, Buster SRAC device, IOWL or Iskra. Cameras, such as Tropel T50/100, a wonder of optical engineering, or Pentax ME 35mm and Molly are also presented. Next to Tolkachev’s profile, stand those of his handlers, no doubt, CIA’s crème de la crème: J. Guilsher, D. Rolph, W. Plunkert or “deep cover officers” such R. Morris and P. Stombaugh. (and John Yeagley, not mentioned in the book). Their dedication and sacrifice were amply described in the book; for their huge contribution, perhaps they should be called “billion dollar case officers”. Their patience, quick decisions and attitude help enormously to run this operation. In the opposite corner, in my opinion, stand DCI S. Turner “strange” decisions not to pursue Tolkachev initiative, almost close not to have such a crown jewel of human source. No doubt, Tolkachev was a complex and delicate man to handle with many switches or problems; the author presented the long debates about his money demands, suicide-pill request, exfiltration plans or the difficult moments of that risky relationship. In addition, there is a good presentation of the Moscow CsOS namely R. M. Fulton, G. Hathaway, B. Gerber or C. E. Gerbhardt; oddly, there is not a single paragraph about Murat Natirboff, who held this position from 1984 to 09.1986. Mr. Hoffman dedicated a good portion of the book for presenting the Cold War context or previous cases or other operations. It is a sound idea: the readers can find compelling details about Penkovsky, Popov, Golitsin, Ogorodnik or Sheymov cases among others. Moreover, the author also addresses to a technical operations conducted in that period - CK Elbow wiretap (later GT/Taw, I guessed); sadly, there were no details about GT Absorb, in my opinion, an equally interesting operation. Finally, in chapter 16 (“Seeds of betrayal”), the author takes the readers inside the motives, frustrations and problems of E. Howard in revealing Tolkachev’s identity to the Soviets. He betrayed not only this source, but also a variety of CIA tradecraft procedures and capabilities: CK Elbow, JIB or his “deep cover” colleagues’ identities. CIA also made a huge mistake in protecting their source by losing three pages from a top-secret Tolkachev document, a fact revealed on page 238. The formidable impact of Tolkachev intelligence is summarized in “Note on the intelligence” section: he delivered design and capabilities of radars deployed on MIG-23/29 fighters and MIG-25/31 interceptors, plus SU-27 multirole fighter and IL-76 AWACS. No wonder, after 1985 the Soviets started a long process to modify their radars and avionics, developing a long series of updates for MIG-29/31 or SU-27. Moreover, he compromised the technical deficiencies of the Soviet SAM radars to intercept penetrators at low altitudes (B-1 B bomber or cruise missiles). Never before a U.S. intel source opened such a window on Soviet intentions and capabilities. As the author stated, his intelligence produced a major impact on the training of US pilots and ensured that US would enjoy almost total air superiority over Soviet-built fighters for more than two decades. The book is filled with 30+ B&W photos, showing, mainly, A. Tolkachev and some case officers. In the conclusion part -“Epilogue”- the author analyses the application of the Tolchacev vast intelligence in a short aerial combat episode during Operation Desert Storm. The study concludes with a very useful four-page “Note on the intelligence”, complemented by „Acknowledgements”, an extensive „Notes” section (32 pages) and the usual index. Energetically written and lucid, it makes an ideal lecture for all Cold War enthusiasts, buffs and pros alike. Highly recommended! Spoiler Alert – this review, like all my reviews – presumes you have already read the book! Original research makes "The Billion Dollar Spy" much more than just a rehash of the known facts of a decades-old case. Former Washington Post investigative reporter David E. Hoffman has unearthed a trove of documents and interviewed dozens of sources. The result is an authentic contribution to our knowledge of Cold War history. While he might not have spoken the last word, this outstanding book is likely to be as close as any Western journalist is able to come for the foreseeable future. One wonders if it has been optioned for a movie, perhaps something along the lines of Billy Ray's "Breach." One problem with a film version is that the story of Adolf Tolkachev, of course, lacks a Hollywood happy ending. From early on, Washington wrestled with the dilemma that, although we knew this Soviet scientist was putting his life in danger, his information was so valuable that we were reluctant to exfiltrate him. The Agency was the addict, and he was for a time virtually the only supplier. To be fair, ultimately it was Tolkachev himself who insisted on continuing his work, thus placing both himself and his unwitting family at risk. Still, we never put our foot down. When it comes to how the case was handled, Hoffman's bias – understandable, in light of the evidence he presents – is in favor of the locals, the hands-on operatives stationed in Moscow, and against their superiors in DC, who often come off as out of touch with the reality on the ground. Looking at the degree of incompetence they displayed, it is hard to dispute this assessment. For instance, when Soviet sources started to disappear, Washington reflexively reacted by suspecting the Marines and low-level Russian help in the US embassy, launching an extended and mostly fruitless witch-hunt. Though some leaks were found (remember Clayton Lonetree? ), only belatedly did the real traitors come to light. Without exception, they turned out to be red-blooded Americans in the homeland, including Aldrich Ames and the deeply religious Bob Hansson. It seems, though, that the first to betray Tolkachev was Edward Lee Howard. Portrayed here as a loser – utterly devoid of any motive beyond anger, spite and greed – Howard should never have been recruited at all, but the Agency failed to figure this out until the eve of his deployment, having already put him through rigorous training. Only at the last minute, when he failed one lie detector test after another, did they unceremoniously cut him loose and cast him back into civilian life, without bothering to provide effective counseling or later checking up on him regularly. Tolkachev betrayed his country because it had unjustly imprisoned and executed close family relatives; Howard because he felt disrespected. Hoffman asserts that Tolkachev was the victim of "betrayal from within [the CIA]." (pg. 218) While this is correct as far as it goes, based on his own evidence there is plenty of blame to go around. Take the FBI. On the one hand, he argues that if the bureau's surveillance of Howard had been minimally competent, he would never have gotten out of Albuquerque. The rookie agent the FBI assigned to watch him was, according to their own internal review, "less than adequate," a bureaucratic euphemism for "totally incompetent." On the other hand, Hoffman also implies – somewhat inconsistently – that the CIA had trained Howard so well that the FBI was simply no match for him. To provide background on Tolkachev's family, Hoffman draws on both unpublished archival material and personal contacts in Russia, though to a far lesser extent than in the chapters that focus on America. His – or more likely the Agency's – translations into English come across as correct if occasionally stilted: "I consider that I have the normal attachment to the family that exists in mankind." The index is frequently inaccurate when it comes to names mentioned in the footnotes. Readers have compared "The Million Dollar Spy" to John le Carré's novels, and there may be something to this beyond just atmospherics. Personally, I find intriguing similarities between Tolkachev and Goethe, the scientist who passed on valuable information in le Carré's "The Russia House." If Goethe's message was, "Our stuff doesn't work," Tolkachev's was, "We are years behind; Soviet air defense systems are weak." Similarly on the issue of how to respond to the US cruise missile threat: "We have just started to study the problem." Assuming for the moment le Carré did base his hero in part on Tolkachev, it comes as little surprise that he dropped the character's first name, discarding the unfortunate "Adolf" in favor of the much better – but still German – cover name "Goethe." One major difference, of course, is that Tolkachev spied for the US, whereas le Carré's hero contacts the British. I have lost count of the number of books about spies, real and imagined, I have read over the decades and did not believe this would turn out as by far one of the most enthralling. The drama moves along at a fast, sometimes furious, pace. Yet the author takes time to flesh out the characters and their often drab surroundings. I was left with enormous admiration for the subject's extraordinary courage over so many years in the certain knowledge that one false move could result in death. At the same time, the CIA's failure to recognize that one of their own would feed back enough information to enable the KGB to identify the master-spy in their midst, arrest and then kill him contrasts badly - almost callously - with the intense care it took over all the meetings in Moscow. Indeed, its blundering failures in attempting to follow its own mole in the pay of the KGB has an air of Keystone Cops about it, thereby enabling the mole to flee unhindered to Moscow. Had the CIA been more on the ball in its own backyard, Tolkachev might have avoided his untimely fate. A must read! This is an incredible book about a brave Russian citizen whose family was brutalized by the Stalin era Soviet system, and as a result went over to the other side and went to GREAT lengths to make contact with the CIA while serving in a HIGHLY sensitive post inside the Russian Military Industrial complex. His efforts were instrumental in saving the US Billions of dollars and also helping the US gain tactical advantages that paid off well into the 1990's during the Gulf War & Yugoslavian Civil War when US forces came face to face with Russian military hardware being used by proxy allies. Tolkachev was a TRUE HERO. This book is both riveting and fascinating.